She sets up the tea things and checks messages. The next person to arrive is usually Ann, who takes her place at the end of the long table closest to the door and begins opening parcels. 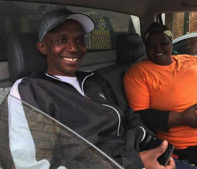 The volunteers from Soweto – Wandi, Lindi, Nani and Mabel – then arrive with Thomas in his car and Vivienne arrives by taxi. The other volunteers – Estelle, Athele, Audrey, Leanne, Bongi and Megan – generally come a little after 10 am using their own transport. The morning begins with a short prayer and any announcements that need to be made. If there is a birthday, it will be celebrated with cake and candles, plus lots of loud singing. otherwise, there are usually muffins and biscuits to go with the tea and coffee. Then everyone gets to work opening parcels. The table seats everyone comfortably with space for squares to be piled up according to size, texture or colour scheme. There is generally lots of chatter between the volunteers, interspersed by ring tones, singing and exclamations about unusual toys or especially lovely squares and blankets. At any one time, Lindi may be taking a call from a carer at a creche to arrange a visit. Mabel may be contacting a social worker at a community centre to see if she and Thomas can come and collect completed blankets. Estelle and Athele may be laying out blankets for Thomas to photograph. 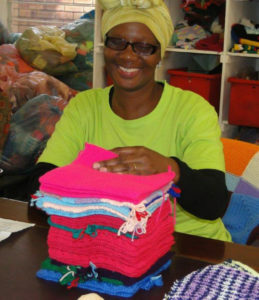 Wandi and Nani may be folding blankets and placing them on shelves. Vivienne may be counting beanies and toys for a distribution. Bongi and Audrey may be opening parcels and noting down the number of squares plus the sender’s details. Anne may be tying up a pack of 35 squares into a blanket pack. Megan may be searching through piles of oddly-shaped squares to match the other oddly-shaped squares she has just discovered in a bag with no label. Leanne may be talking to Ronda about the post office workers’ strike or latest petrol price hike, gathering news that she can incorporate into a blog post. 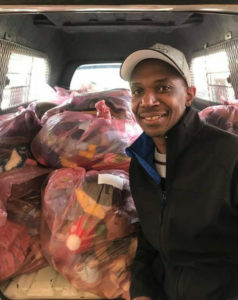 Say Lindi and Thomas are going to deliver blanket packs to a gogo group. The blanket packs will have been prepared in advance, nine packs per bag. Thomas will load them into the van and they will set out for the community centre where the gogo group meets. Linda will take along the book with the numbers written down, and the social worker or gogo in charge will sign for receipt of the packs. 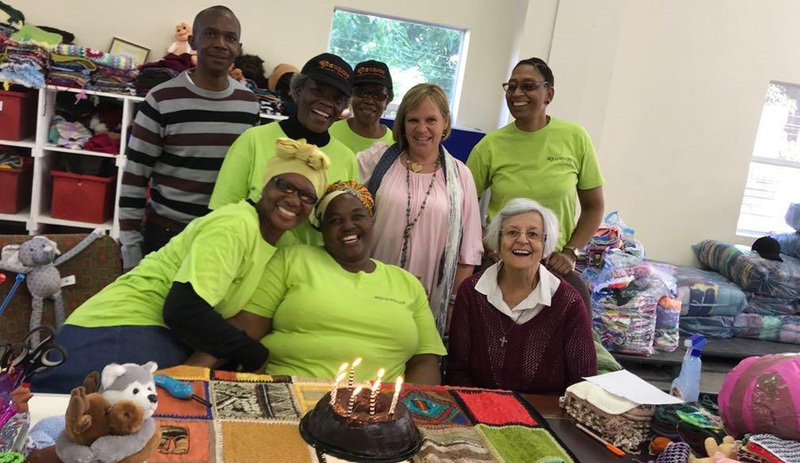 The gogos are always happy to see the volunteers because they enjoy sewing up the blankets and particularly appreciate being able to make a little money from their work. If the trip involves collecting completed blankets, the volunteer will count the blankets to check that the right number are being returned. She will then hand over the cash payment for the completed blankets. 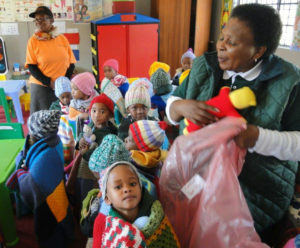 Depending on what has been arranged, she and Thomas will then either return to the barn with the bags of blankets or proceed to a creche for a distribution. Many of the crèches that the volunteers visit are very inaccessible, being in the middle of informal settlements. Sometimes it is hard to get from the van to the crèche, especially with the heavy bags. They always make a plan though, and are noisily greeted by the children who have been expecting them. There are often songs and prayers to welcome them. Occasionally, one or two of the smallest children will be afraid of the strangers in their midst and need to be comforted. Mostly, though, there is exuberance and cheering as the blankets are pulled out of the bags and wrapped around each child’s shoulders. With so much excitement, it is impossible to go slowly or let the children pick the blankets they like. 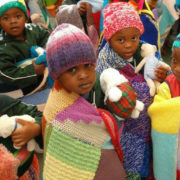 Instead, the volunteers do their best to give the pretty, paler blankets to the girls and the bolder, darker blankets to the boys, and to hand out suitably-sized beanies, hand-warmers and toys. A distribution in Soweto can take up to four hours. The team gets back to the KasBarn feeling hungry from their morning’s work. Lunch is usually something hot and tasty like KFC, fish and chips, pies or sandwiches. 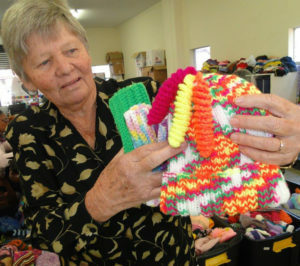 By the time it arrives though, only half the volunteers are there to eat it, since many head home at lunchtime, usually taking with them a couple of blanket packs to sew up themselves or some odd-shaped squares to edge. The remaining volunteers work a little longer then lock up and leave the KasBarn till the following opening day. On occasion, during the week, the volunteers do other KAS-related work. 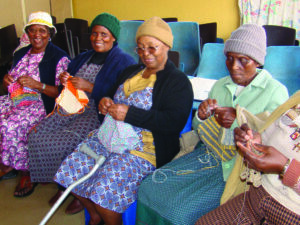 For example, the Soweto ladies may visit a new gogo group to show them how to sew the squares into blankets. Estelle and Athele may deliver blanket packs to friends who enjoy sewing up blankets for the pure pleasure of doing something creative. Leanne may write a few emails to members who have made donations. Thomas may help Ronda collect the post. And Ronda – who is, of course, also a volunteer with the biggest heart ever – keeps track of the books, answers queries, corresponds with the forum moderators and manages all the day-to-day crises that face an NPO struggling for survival in the South African context. 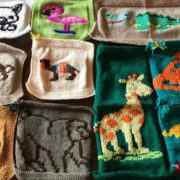 We hope this will inspire you as a compassionate crafter to add to this wonderful work to provide love, comfort and warmth for orphaned or vulnerable children. 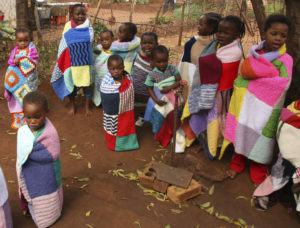 So, please crochet or knit a square (or more) and send them so these dedicated KAS SA volunteers can wrap orphaned or vulnerable children in lovingly made, warm blankets. You can find out all about how to contribute here. 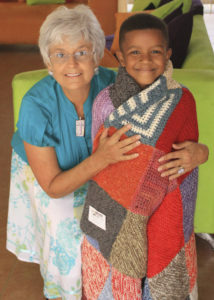 Join us the warmest crafters on earth in our Square Circle Forum for knitting and crocheting fun as you work to warm and comfort for children so greatly in need of your love. If you would like to volunteer at the KasBarn, please contact Ronda at +84 504 4050 and 084 504 4050 locally. We need all the help we can get.